UK – Jay-Z’s current Magna Carter world tour has been wowing audiences up and down the globe since its first gig at Manchester Arena on 3rd October. Wakefield’s one-stop-shop stage, set and studio rental facility, LS-Live, was therefore a convenient first stop on the schedule for the US superstar. 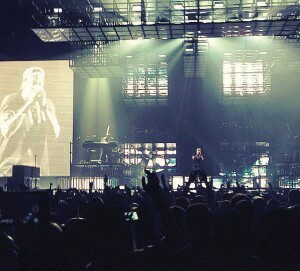 For his first solo headline tour in almost four years, Jay-Z wanted to pull out all the stops, so his production team led by production manager Bobby Schneider enlisted LS-Live to design and build what was to become one of the company’s biggest projects of 2013; an enormous set of internally lit cubes both on a rolling house stage and hung overhead, encompassing 17km of aluminium and 400 Pulsar LED ChromaPanels. Schneider had worked with LS-Live on the successful production of Jay-Z’s one-off show for the BBC Radio One Hackney Weekend in the summer of 2012, so he knew it would be the perfect choice for both a rehearsal venue and the stage set design and build. He booked all the Studio facilities for over a week’s rehearsals in late October. Working under the direction of lighting designer Jesse Blevins and Designer Willo Perron, LS-Live created a stage set of cubes that occupied half of its 17,664 sq ft rehearsal arena. The set functions as both a dynamic performance platform for the artist and band, and a visual spectacular encompassing integrated lighting and LED panels. Cube structures form the basis of two 8’ high lit up runways in a ‘T’ formation for Jay-Z’s entrance and performance, with additional risers for him and the band at different levels; a pattern that is directly mirrored in the flown system overhead. The effect is a stripped back monochrome environment of flickering light, not too far removed from the look of New York’s industrial warehouse raves. Said LS-Live director Ben Brooks: “There were two big challenges with this set, one was designing it so that it all packs down into as few trucks as possible, the other was to permanently integrate the LED strips and panels into the cubes for quick builds and de-rigs on site whilst ensuring they could withstand the rigours of touring. During this process, LS-Live accurately estimated the whole set would pack into five touring artic trailers, including LS-Live’s 2.2’ high rolling house stage which forms the base of the set, hidden beneath a series of mirrors to maintain the look of the cube set above. The 17km of aluminium was structured into 2’ by 2’ box sections (manufactured on site at Prolyte Products UK), the cubes are fitted with VER’s vertical and horizontal LED blade strips inside, with 400 Pulsar LED ChromaPanels attached under a macralon surface to provide a lit walkway for the performers to walk on. LS-Live introduced a new labelling system for the cube structures to enable crew to quickly locate and build the set in the correct configuration on site. This system carried through to the bespoke branded panels for the side of each dolly, which indicate the tour dates, branding and the colour code system with a drawing of the set in 2D showing where each particular piece goes. The ten-strong team of touring set carpenters includes Gareth Edwards, who graduated from the FdA Live Events Production course at Backstage Academy – the backstage skills centre on site at LS-Live – in 2013. Brooks put him forward for a position on the tour, having been so impressed with his talent and attitude throughout the course, and the work experience he had undertaken in the Studio. They also took advantage of Load Cell Rental’s tour weighing service as part of the LS-Live package. Rather than relying on estimates of the weight loads of their flown equipment, they obtained an independent report including the calibration certificates of all the cells, which were set up and assessed upon load in. Said Brooks: “It’s been fantastic working with Bobby, it’s not been without its challenges, no set of this size ever is as there’s so much going on. It was the 28th of August that Bobby called me to say congratulations we’d won the set build and to be there five weeks later with this big set built was a great achievement and a real team effort. Said Jesse Blevins: “The quality of the finished product is outstanding. This gig was very ‘unique’ in that the timeframe that everything happened in, from conception to completion, was unbelievably short. “Ben and his entire team went above and beyond. Anything we needed they were there for. Being able to tech and rehearse at their facility proved invaluable. Any changes or modifications that we needed could be addressed immediately. “We didn’t waste time having to take anything apart and ship, that would have been time we definitely didn’t have. “The private bedrooms were very convenient and comfortable as well. Being able to go from FOH right upstairs to bed in five minutes was awesome, it maximised the little time we had to design/program.